When my first child was born, the impression of each day felt so strongly imprinted on my mind, on my whole being really, that I couldn’t imagine forgetting a thing. Some of the details would fall through the cracks, I accepted that. But the broad strokes, the big moments, surely, surely these would never fade. If I could remember the birthday of someone I hadn’t been in touch with for twenty years or the name of the bunny from my kindergarten classroom, how would I ever lose the words of my son’s first sentence? Memory, however, is not bound by this rule of logic. It is a tricky and selective creature and, as such, I didn’t trust it when it came to my baby. The task at hand was, instinctively, far too important to me. If I didn’t collect the facts of this boy’s early years, who would? If I couldn’t recall the age of his first gummy smile and his first wobbly step and his first garbled ‘I love you’, what was to say that these things wouldn’t slip away like so much sand through fingers? And so from the time he was about two months old, I became a memory keeper, a custodian of the precious pieces of his childhood. I bought a notebook and began to date it and to fill its pages, one after the other, with his life as I witnessed it. When the next child came, I bought another notebook and another and another after that. Sometimes the entries are days apart, sometimes they are weeks apart. Sometimes they are short lists of new foods tasted or funny questions asked, sometimes they are more fluid paragraphs about moods or aspects of a personality. Not every parent records the data of childhood like this: I realize there is a serious idiosyncrasy at work here. But we are all memory keepers for our children, we just go about it in different ways depending on what exactly we are trying to preserve. Pictures, videos, memorabilia, take your pick. My compulsion is for milestones – these are what I am desperate not to forget – and it is the written word that captures them most accurately. I’m not sure why it matters to me when the tooth was cut, the shoes put on for the first time, the name at last written in spidery letters, but I know it does. My mother had a similar interest, maybe this has something to do with it. My sister and I both have baby books and while they are, admittedly, patchy in places (mine as the second child more so than hers), I wonder if their existence convinced me on some subconscious level that the first years of a baby’s life require transcription. A large part of it, though, is simply me. From the minute I became a mother myself, I have felt unambiguously that the age at which children do things is somehow a clue to their identity. The process of discovering who they are – and who they are going to be – was so thrilling to me that I marshalled all the evidence I could. It’s not terribly surprising: I am an academic by training. But the most compelling reason I took care to keep such a precise timeline was because it goes So. Damn. Fast. Marking time felt like a way to hold on to the speeding train of my kids’ lives, to ensure that I would remember for eternity what 18 months was like compared to 24 months compared to 36. The phases of childhood come tripping over each other and then they pass just as swiftly. Each stage is sealed in a bubble so discrete that once it bursts it can become nearly impossible to access it again. My notebooks were supposed to be my access card. And yet, what I didn’t take into consideration is the reality that remembering the facts of an event or stage of development is a different beast from remembering how you feltabout it or what it meant to you. So much so that the two types of memory rely on wholly different parts of the brain. We can check our notes, in other words, and drudge up every nighttime waking, every bout of colic, every episode of stranger anxiety or clinginess, but the ability to recall the emotional experience that goes under the heading of ‘difficult baby’ is something else altogether. For this kind of memory, I see now, there aren’t really aides de memoire. There is only a molding of the facts, as we happen to remember them, into an emotional narrative that chooses us more than we choose it. This is the story we then carry with us about the ‘difficult baby’ or the ‘inquisitive toddler’ and while it might not necessarily be ‘true’, it is the one that becomes truly ours. Because, in the end, it is often this story that takes precedence over the cold hard facts. It is this story that we continue to tell, vividly, to ourselves – and to our friends and to our kids, when they are finally old enough – long after the details of the experience itself have paled in our minds. My last child just had his first haircut. I took the pictures. I noted the date. 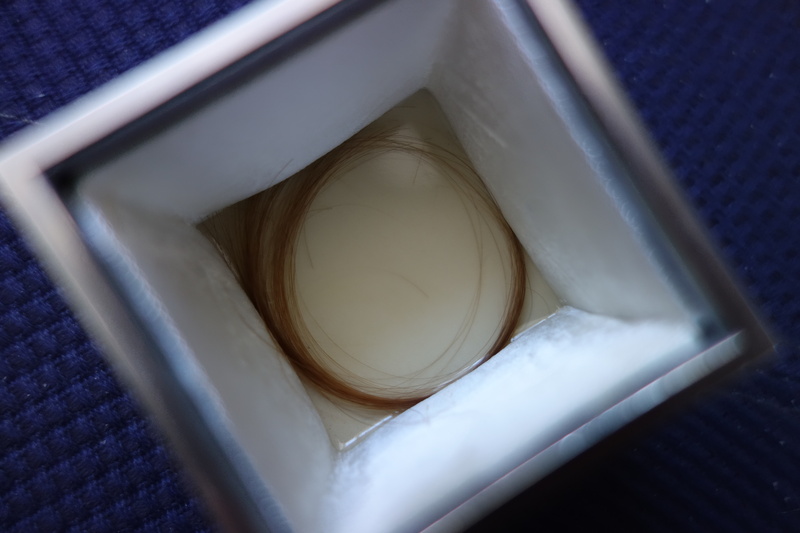 I stowed the lock of hair in a zip-lock bag. All of these things guarantee that I won’t forget this milestone. But will I remember how I felt when he walked through the door, one hand clutching his father’s, the other a red lollipop, with the beginnings of pride creeping into the corners of his mouth? 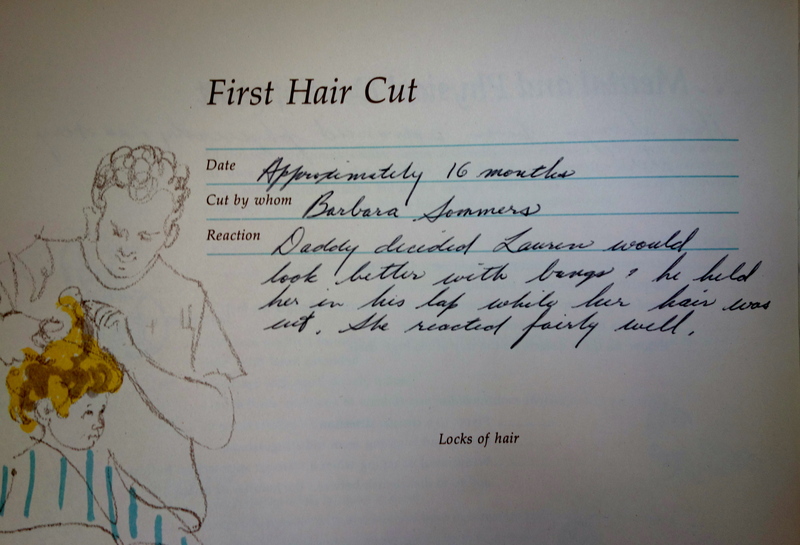 Will I remember the way my heart squeezed tight to see my baby transformed as if by the magic of a pair of scissors into a proper little boy? Only time will tell. Lauren, I completely identify with your ‘memory keeper’ essay. I also kept a record of Darren and Alison from birth, writing down landmarks, events small and large, from their discovery of their fingers and toes to their rolling over, crawling, and first steps; their babblings which became more like strings of sounds with ‘almost words’ in them, and their first words and sentences were carefully recorded in my notes. I too was trying to capture their essence so I would remember what they were like at these precious stages, and remember how I felt too–those “heart-squeeze” moments when they grab your hand to walk into a room together, when they say “I love you”, when they laugh at something funny you did for them. I was so aware of how fast it was whipping by me, and I tried to grasp these fleeting moments and days, and what these little individuals of 8 months, 15 months , 2 years, 4 years and on, were like. Rob made up a word to describe my concern about how rapidly they made the transitions from infant to baby to toddler to little child to school boy/girl—he called it “prestalgia”, that is nostalgia about the present you are living! So aptly put. 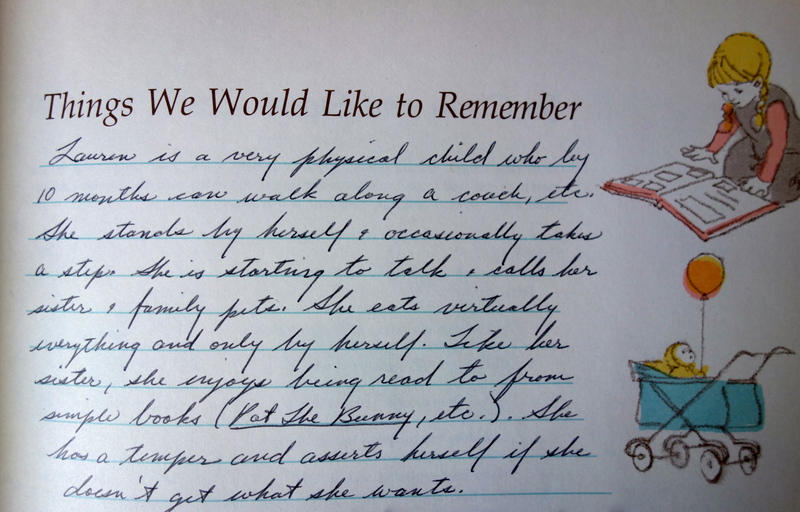 I didn’t keep nice fabric covered books with pictures and short notes that most Moms keep, and that my adult children probably would have preferred. No, I filled pages of lined yellow notebook paper, both front and back sides jammed with unkempt writing (talk about the academic in us!) These sheets are now stuffed messily into a binder in a closet in my house, not very accessible to my children now they are parents, because they are so daunting, so voluminous. I read through them every once in a while when a grandchild is a certain age and I want to remember how their parent was at that age too! I sometimes catch my breath at some memory forgotten now recalled. It’s not just their childhood that is there, but it is also my youth. By the way, there may be some baby teeth and locks of baby hair in a drawer somewhere in my house too, but don’t tell anyone! oh my goodness, nancy, i am blown away by this comment. 1) because i love the idea of your lined yellow notebooks and the fact that we are kindred spirits in this respect. 2) because I almost forgot to breathe when I read: ‘It’s not just their childhood that is there, but it is also my youth’. and 3) because i am now going to be obsessed with the word ‘prestalgia’, something i suffer from intensely. thank you for being the memory keeper of that nugget of gold, I can almost hear uncle bob saying it.